The adapter has been cleaned and is in good condition. Nintendo Entertainment System NES RF Switch Adapter. Condition is Used, may have minor wear n tear, free and fast shipping. May have minor scratches. TESTED & WORKS. Up for sale your consideration: RF Modulator (NUS-003). Trending at $1.01eBay determines this price through a machine learned model of the product's sale prices within the last 90 days. This has been briefly tested and works without any problems. Pictures are of exact item you will receive. One original Nintendo rf switch. 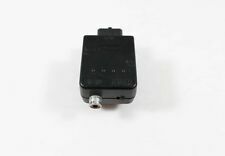 This connects to you TV via the coaxial input. Cleaned and tested working. You will receive one in similar condition to the picture. Nintendo RF Adapter Switch Nes, Snes & Sega Genesis Oem Original. Condition is Used and tested to work great! Shipped with USPS First Class Package. Replace your lost/broken standard power cable and RFU Cables. Platform:Nintendo SNES. Included:Power Adapter and RF Cable. We will do our best to resolve any problems that may arise. Weight:9 oz. Box is in great condition! Open box in working condition. Nintendo NES RF Switch Video Adapter Cable NES-003. Condition is Used. Shipped with USPS First Class Package. We strive to provide you with the best service possible. If for any reason you’re not happy, give us a chance to make your experience the best it can be. NES SNES N64 Nintendo RF Switch NES-003 AV Cable Adapter. Plus RCA cable for the NES. Tested Working. In used condition. 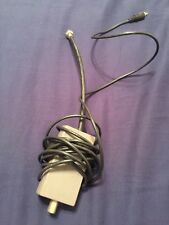 NES SNES Video Cord. Official OEM Nintendo RF Switch Coax Adapter. Original OEM Nintendo RF Adapter Cable NES-003 Cleaned & Tested! Original OEM Nintendo NES RF adapter cable #NES-003, cleaned & tested!What you see is what you get! Nintendo NES. RF Adapter Cable #NES-003. 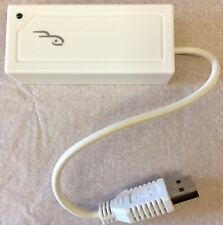 Nintendo Wii Wired USB Network Ethernet Cable LAN Adapter Rocketfish RF-GWII008. Condition is Used. Shipped with USPS First Class Package. TESTED AND WORKING. NON CONTINENTAL USA AK / HI / PR / APO / FPO / & OTHER US TERRITORIES. Lot / ID # : GS / APR / 201 9. Nintendo NES RF Adapter. Official Nintendo OEM NES-003 AV Cable. Pre-owned, great condition. Nintendo RF Switch NES OEM Adapter NO FRAYED OR CUT WIRES !!!!! WORKS GREAT !!!! Woks great! what you see is what you get! Nintendo RF Switch NES & Snes 003 OEM Adapter RF Cable FREE SHIPPING!!! Up for sale is a OEM Nintendo RF Switch video cable. The item is tested before shipping. I have more than 5 of them for sale so the one you receive may not be the one pictured above but will certainly be tested. Thanks for looking! OEM NINTENDO NES RF ADAPTER (NES-003). I HAVE 6 OF THESE IN HAND, EACH HAVE BEEN TESTED AND VERIFIED. I AM ALWAYS ON THE HUNT FOR RARE COPPER, BRONZE, SILVER & GOLDEN AGE COMICS! 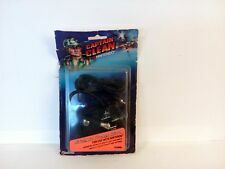 IN ADDITION TO COMICS I FIND UNIQUE COLLECTIBLES! RF Switch is in good condition and sealed showing light wear from previous use. Nintendo RF Switch NES & SNES - NES-003 - OEM TV Adapter - Fast Shipping! Official Super Nintendo RF Adapter. Condition is Used. Shipped with USPS First Class Package. We are Lucy's Strawberry Fields. We never compromise on quality, period. Anything wrong?. Original Nintendo RF Switch NES 003 System Console Adapter Cable Cord OEM SNES . Condition is Used. Shipped with USPS First Class Package. Adapter is in good condition! Trending at $11.81eBay determines this price through a machine learned model of the product's sale prices within the last 90 days. Nintendo 64 N64 RF Modulator NUS-003 Adapter Good Shape. Used but still in great shape. This is for only (1) of the Nintendo 64 RF Modulator NUS-003 Adapter shown in the pictures. Use this along with an RF cord to attach your Nintendo 64 console to the back of a TV set. I try my best to describe conditions and provide adequate photographs. 3rd Party Atari 2600 Power Adapter. 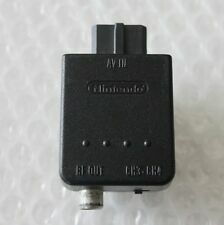 Original Nintendo RF Adapter. Official Original NES-003 RF Audio Video Switch Adapter Cable Cord Good Cond. ! !